The city of Bharatpur is situated where the Ruparel and Banganga rivers meet and contains a Palace and a Fort surrounded by a moat. 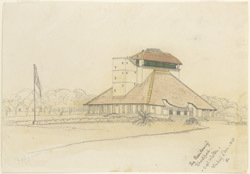 This drawing is a view of the Residency, also known as the Agency bungalow. It was the home of the Resident, the political officer of the British Raj, who administered an area that included the three states of Bharatpur, Dholpur and Karauli. The first Political Agent (known as Residents after 1881) for the district was appointed in 1855 and in 1897 the headquarters were transferred from Dholpur to Bharatpur. The bungalow is an example of British colonial architecture and is built in an Anglo-Indian architectural style. The single-storey dwelling with a verandah shown here was later enlarged with the addition of a wide entrance and a double-pillared colonnade surrounding the whole structure.